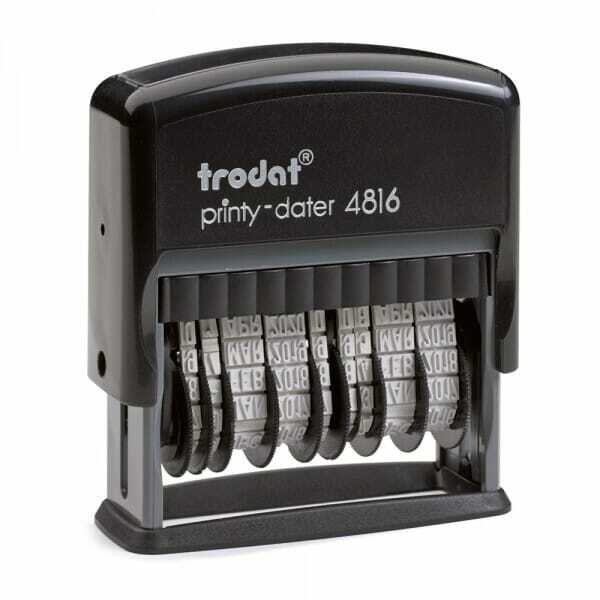 Practical double dater - perfect for use in the office: With the Trodat Printy 4816 you can stamp two different dates side by side, separated by a hyphen. The date has a height of 3.8 mm and the format: day, month (in letters) and year. The year bands include 12 consecutive years. Size of the date is 55 x 7 mm. Suitable replacement ink pads 6/4817 in black, blue, red, green and violet are available to further extend the life of your self-inking stamp. Trodat Printy 4816 is made with the highest technically possible proportion of post-consumer recycled plastic to reduce its CO2 footprint and becomes climate-neutral by compensating for remaining, unavoidable CO2 footprint with investments made in climate protection projects. Customer evaluation for "Trodat Printy Double Dater 4816"